"But we can say collectively, in our collective experience, individuals with CTE — and CTE of this severity — have difficulty with impulse control, decision-making, inhibition of impulses or aggression, often emotional volatility and rage behaviors"
Researchers say the damage to Aaron Hernandez's brain was to areas that impact memory, judgment and behavior. Former New England Patriots player Aaron Hernandez suffered substantial damage to parts of the brain that affect memory, judgment and behavior from the most severe case of a degenerative disease linked to head blows ever found in someone so young, a researcher said Thursday. 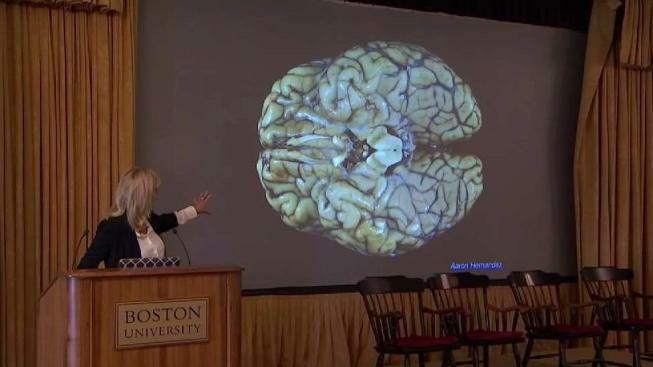 Dr. Ann McKee, director of Boston University's CTE Center, stressed that she could not "connect the dots" between the brain disease chronic traumatic encephalopathy and the behavior of the 27-year-old who hanged himself in April while serving life in prison for murder. 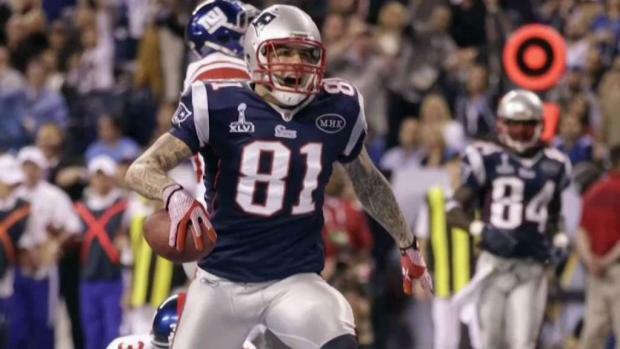 But McKee said CTE had significantly impacted key parts of Hernandez's brain, including the hippocampus — which is associated with memory — and the frontal lobe, which is involved in impulse control, judgment and behavior. The next youngest person whose brain they've examined that showed such serious CTE damage was 46 years old, McKee said. "These are very unusual findings to see in an individual of this age," McKee said. "We've never seen this in our 468 brains, except in individuals some 20 years older." "We can say collectively, in our collective experience, that individuals with CTE — and CTE of this severity — have difficulty with impulse control, decision-making, inhibition of impulses or aggression, often emotional volatility and rage behaviors," said McKee, who has studied hundreds of brains from football players, college athletes and even younger players, donated after their deaths. Prosecutors contended he gunned the two men down after one accidentally spilled a drink on him in a nightclub — and then got a tattoo of a handgun and the words "God Forgives" to commemorate the crime. While the outside of Hernandez's brain appeared normal, the inside was riddled with CTE, she said. There was evidence of previous small hemorrhages, which experts associate with head impacts, she said. Other parts, like the hippocampus, had begun to shrink and large holes were found in his brain's membrane, McKee said.